University of Dayton officials joined Emerson for the April 27 ribbon-cutting of The Helix Innovation Center, a $35 million state-of-the-art "ideation" facility on the University's campus where the company plans to create solutions to the world's heating, cooling and refrigeration problems. Along the way, they'll tap the brainpower and creativity of the University's people. "With Emerson, we have a link directly to industry and an opportunity very few universities have," said University President Daniel J. Curran. "This is a place where our students, faculty and researchers will interact with our partner Emerson in a new kind of collaboration." 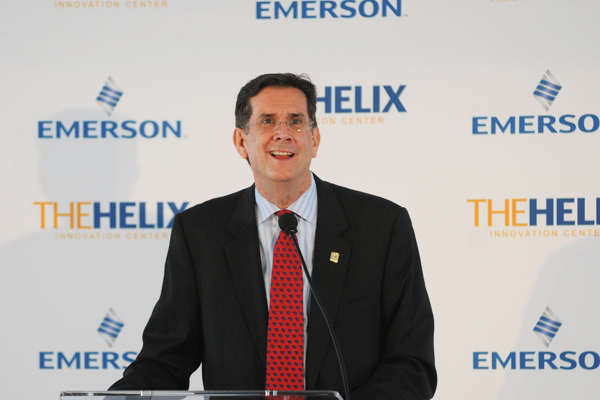 Bob Sharp, executive vice president of Emerson, highlighted the 35-year relationship between the University and Emerson, a relationship that was the foundation for the company's decision to locate The Helix on campus. Guests toured The Helix Innovation Center's full-scale, simulated environments, including a working commercial kitchen, a two-story residential home, a grocery store, a data center and the whole facility as a commercial building. Teams will use the facility to generate new ideas and then test them under real-world conditions. Construction and usage of the facility has been fast-tracked since the July 2014 initial announcement and The Helix has welcomed more than 3,000 participants to innovation workshops just since December. University of Dayton students designed “supermarkets of the future” as part of the E-Week Innovation Challenge sponsored by Emerson during the university’s Engineers Week. Designs were submitted by 45 students. The Helix welcomes all kinds of student creativity -- not only engineering. Emerson commissioned three University art students to design large 3-D art pieces that highlight Emerson's history and future. "This is the kind of place where invention will happen and the future is made," said Dayton Mayor Nan Whaley, '98. For more on the partnership between the University and Emerson, visit Relationship Building. For more on the new facility, visit The Helix.